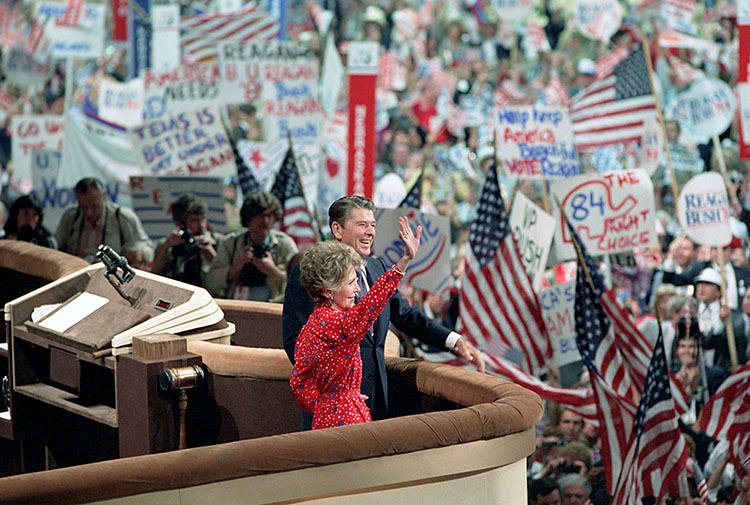 President Ronald Reagan and First Lady Nancy Reagan at the 1984 Republican National Convention. Photo courtesy of Wikimedia. Standing at the U.S.-Mexican border in Laredo, Texas, then-candidate Donald Trump wears a white, bulky hat. It has his campaign slogan — “Make America Great Again” — emblazoned across the front. No matter what emotions the iconic hat inspires, its words resonate with Trump’s supporters. Yet, Trump didn’t invent the slogan himself. Ronald Reagan also made “Make America Great” part of his campaign for president. 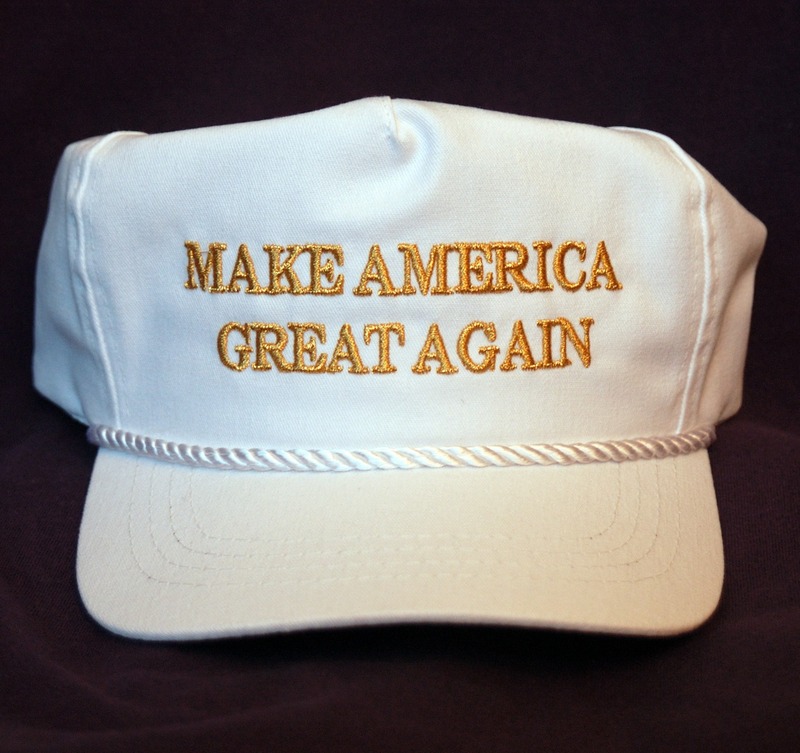 President Donald Trump’s iconic white campaign hat. Photo courtesy of Wikimedia. In that speech, Reagan capitalized on the electorate’s nostalgia — a sentimental longing for the past. He idealized a rosy, simpler time in American history. Intentionally or not, the actor-turned-revered-politician set the foundation for the flashy, 70-year-old billionaire rise to the presidency. Nostalgia derives from the Greek word meaning homesickness, said Robert Lehrman, former speechwriter for Vice President Al Gore. It’s a rose-tinted, sentimental viewpoint of the past. Contemporary politicians can invoke nostalgia through speeches, advertisements or other forms of political communication, he said. “Politicians use it to remind people of a better time in their lives, or in the political life of the United States,” said Candice Nelson, chair of the government department at American University. Different segments of the population may also reflect differently on the past, Lehrman said. One candidate that made nostalgia a central part of his campaign was Ronald Reagan, Nelson said. When Ronald Reagan ran for president in 1980, inflation plagued the U.S. economy, Iran held American students hostage and the Cold War threatened American security. Four years of President Jimmy Carter’s administration were unsuccessful, Nelson said. 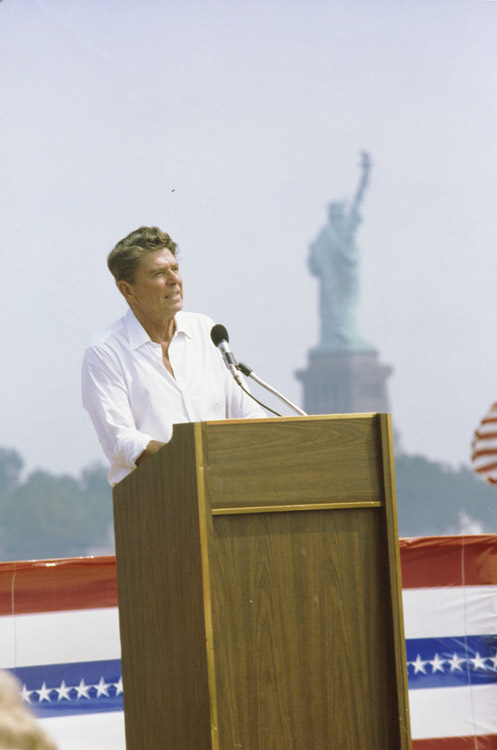 Ronald Reagan giving a speech in Jersey City, New Jersey in September 1980. Photo courtesy of Ronald Reagan Presidential Library and Museum. Storytelling was central to Reagan’s candidacy, said Clark Judge, former speechwriter and special assistant to both Reagan and then-Vice President George Bush. In public speeches — which were his strong suit — he told stories about “airplanes that were older than the men who flew them” when trying to convince voters that he would be the right president to rebuild the military, Judge said. Reagan reshaped the Republican Party, situating himself as a revered conservative leader, Lehrman said. “When Republicans remember Ronald Reagan, and I’m somebody who couldn’t stand Ronald Reagan, they see a genial person who is eloquent, who believed in values like a balanced budget, self-reliance, that people today really do value,” Lehrman said. There hasn’t been another candidate who used optimism in the same way, McBride said. His presidency “was, to some extent, a story of a seeking of rebirth, a fall, and then a seeking for renewal, repair, resurrection, which was achieved in those eight years,” Judge said. 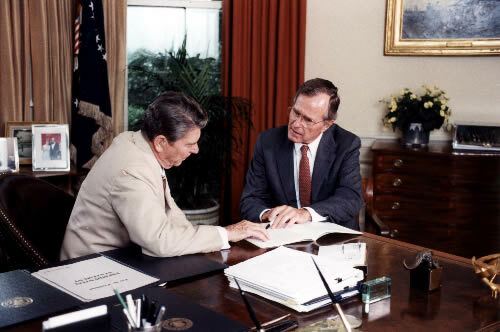 Reagan and Vice President George H.W. Bush during Reagan’s first term. Photo courtesy of Wikimedia. As president, Reagan’s public persona resembled a mix of George Washington, Abraham Lincoln, Franklin Roosevelt and Dwight Eisenhower, Judge said. His sense of optimism, giving Americans a “sense of a better tomorrow,” most closely mirrored Roosevelt. Jan. 20, 1981: Reagan is sworn in as the 40th president. On the same day, Iran releases the 52 remaining hostages. March 30, 1981: Reagan is shot in the chest upon leaving a Washington hotel. He makes a full recovery after surgery. April 28, 1981: Reagan appears before Congress for the first time since the assassination attempt. September 1981: Reagan appoints Sandra Day O’Connor as the first female justice on the U.S. Supreme Court. April 20, 1983: Recession ends. Oct. 23, 1983: U.S. Marines in Lebanon, Beirut are attacked by suicide bombers. Oct. 25, 1983: U.S. invades Grenada, which Reagan saw as the next step in eliminating communism. To First Lady Nancy Reagan, the White House should symbolize this new era in American politics. She restored elegance and charm to the White House, McBride said. “It’s a diplomatic message,” McBride said. Her spending — including $200,000 for new china for the White House — sparked controversy. In a 1981 New York Times article, Lynn Rosellini writes about her nickname “Queen Nancy,” which political opponents used against her. “I’m just being myself,” she told Rosellini in 1984. Reagan’s ability to communicate remained essential in his 1984 campaign for a second term, which centered around a “Morning in America” theme. He ran against Walter Mondale, the Democratic nominee. “I can’t remember a time since 1984 when it was so uplifting, where it was so optimistic,” McBride said. A one-minute commercial, titled “Prouder, Stronger, Better” but known as “Morning in America,” promoted an image of America as moving toward a better future. Things were better than they were four years ago, and Reagan had restored the tranquility of the 1950s, according to the ad. Advertising executive Hal Riney wrote and voiced the famous advertisement, according to NPR. At least two 2016 campaign ads — by Bernie Sanders and Marco Rubio — mimicked “Morning in America.” Marco Rubio’s ad flips Reagan’s optimism on its head, depicting how Americans are worse off after eight years of President Barack Obama’s leadership. Reagan’s optimistic campaign — demonstrated by “Morning in America Again” — resonated strongly with voters. Reagan defeated Mondale in a landslide victory, winning 49 out of 50 states. Both Reagan and Trump were outsiders, and neither a career politician. They drew support from “those who are nostalgic for a time that they imagine that America was great,” Lehrman said. There is no such thing as “one kind of Trump voter,” writes Emily Ekins, research fellow and director of polling at the Cato Institute. However, American Preservationists — those who believe the economic and political systems are rigged and have nativist immigration views — made up the core of Trump’s constituency that made him victorious in the primaries, she said. Staunch conservatives, free marketers and anti-elites carried him to victory in the election — and into office on January 20, 2017.